Not long ago, we had virtually no crime in our neighborhood. Today we are singing a different tune. Neighbor Kathleen Savio's "accidential drowning" death is now considered a homicide by a leading forensic pathologist. She lived across the street from us, just a few doors down. 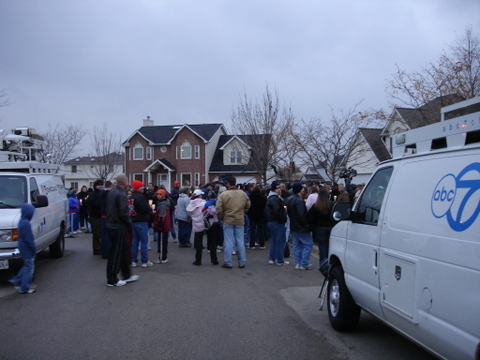 On this same street is the home from which Stacy Peterson disappeared. Many from the neighborhood participated in the candlelight vigil for both victims on Saturday, 11/17, pictured below. Hope the responsible individual is held accountable soon, along with any accomplices. Many thanks to Bolingbrook Police Chief Ray McGury for doing the right thing throughout this tragedy. Please note that he was not Police Chief when the earlier episodes -- widely discussed in the media -- took place.